Want a glimpse of the traditional Dutch way of life? 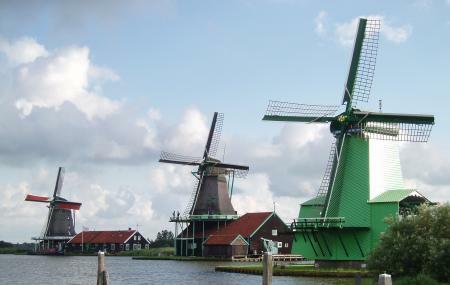 Zaanse Schans offers just that with charming old windmills, traditional houses, cafes, wooden shoes stores and workshops. Preserving the neighbourhood as it was in the 18th and 19th centuries, Zaanse Schans is located half an hour’s drive from Amsterdam. Once a bustling industrial area, the region is now a reminiscent of the days gone by. Boasting of a footfall of over millions tourists every year, do add Zaanse Schans to your Amsterdam itinerary and explore the unique history of Netherlands. Each individual attraction had different ticket prices. Please check the official website for the same. During the high season, which is from April to November, almost everything is open from 10:00 am to 5:00 pm. The timings are subject to change during off season. Please check the official website before planning a visit. Bus 391 from Amsterdam Central Station to Zaanse Schans. How popular is Zaanse Schans? People normally club together Zaanse Schans and Schansend 7 while planning their visit to Zaanse Schans.